We usually prefer the Dark Chocolate variation. 2⅔ cups rolled oats (use old-fashioned, not quick or instant). 6 ounces white chocolate, broken into pieces. ½ cup walnut halves, finely chopped. 1 cup (2 sticks) unsalted butter. 1⅓ cubs firmly packed light brown sugar. 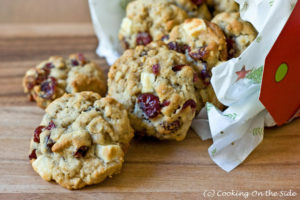 Whisk oats, flour, baking soda and salt together in a medium bowl; stir in dried cranberries, white chocolate and nuts. In a medium saucepan, melt butter over medium heat. Continue to simmer over medium-low heat until the milk solids turn golden brown, about 4 minutes. ; take care not to burn. Pour browned butter into a large bowl and whisk in brown sugar until combined. Whisk in cinnamon, then whisk in eggs and vanilla, beating well after each. Add dry mixture to wet ingredients and stir just until combined. Mixture will be thick. Drop by generously rounded tablespoon 2 inches apart onto cookie sheets. Bake until light golden brown and just dry to the touch, but still a little soft inside, about 10 minutes. (For chewier oatmeal cookies, bake 30 seconds to 1 minute less. For very crispy cookies bake 30 seconds to 1 minute more.) Slide parchment onto racks to cool cookies completely. Dark chocolate cherry oatmeal cookies: Substitute dark chocolate for the white, and dried cherries for cranberries. Browned butter oatmeal cookies with milk chocolate and candied orange: Substitue milk chocolate for the white, and diced candied orange for the cranberries. This entry was posted in Recipes and tagged cookies, dessert, Recipes on December 12, 2011 by Mike. Amounts can vary as needed. 1 tsp or more chopped garlic. ⅓ to ½ cup sherry. Juice of 1 large lemon. Topping of 3 parts Panko bread crumbs to 1 part parmesan cheese. Add garlic, sherry and lemon juice to butter and mix well. Place a single layer of scallops in baking pan. Pour butter mixture over scallops. Remove from oven, turn scallops and broil for 4 minutes more. Remove and turn again. Top with bread crumb and cheese mixture and return to broiler for 1½ to 2 minutes. Watch carefully so it doesn't burn. This entry was posted in Recipes and tagged Aunt Joan, Recipes, scallops on December 12, 2011 by Mike. Add any fresh veggies you like. We’ve used spinach lightly wilted and steamed asparagus. Wilt spinach or steam veggies and set aside. Whisk eggs in large mixing bowl. Add sour cream and whisk until smooth. Add allspice, ginger and pepper then mix in throughly. Stir in cheeses and veggies. Pour half of mixture into each 9 inch pie plate that has been lightly coated with cooking spray. Cook in 350 degree oven for 40 minutes or until top is golden brown. This entry was posted in Recipes and tagged Breakfast, dairy, quiche, Recipes on September 30, 2011 by Mike. Season chicken with 1/4 tsp. black pepper and the kosher salt. coat and unheated very large skillet with nonstick cooking spray. Preheat over medium heat. Add chicken; cook until browned, turning to brown evenly. Reduce heat to medium-low. Cover and cook for 10 to 12 minutes or until chicken is tender and no longer pink (170° F). Remove chicken from skillet. Cover to keep warm. Add, broth, garlic, crushed red pepper and 1/4 tsp. black pepper to the same skillet. Bring to boiling. Stir in greens; reduce heat. Cook for 4 to 6 minutes or just until greens are tender, stirring occasionally. Sppon greens and their juices onto four dinner plates. If desired slice chicken. Place chicken on top of greens. Drizzle lightly with balsamic vinegar. If desired, garnish with bell pepper slices. Nutrition facts per serving: 161 cal., 2 g total fat (0 g sat. fat), 66 mg chol., 351 mg sodium, 7 g carbo., 3 g fiber, 30 g pro. For Wave 1, serve with cooked quinoa. For waves 2 and 3, serve with cooked quinoa and fresh apple slices. This entry was posted in Recipes and tagged Sonoma Diet, Wave 1, Wave 2, Wave 3 on February 22, 2011 by Mike. * Note: If you can’t find basil and tomato feta cheese, stir 1 tsp. finely chopped fresh basil and 1 tsp. snipped oil-packed dried tomatoes, drained, into 1 ounce (1/4 cup crumbled) plain feta cheese. In a small bowl combine feta cheese, cream cheese, and mint; set aside. Using a sharp knife cut a 1 1/2 inch horizontal slit through the thickest portion of each chicken breast half to form a pocket that is about 1 inch deep. Stuff pockets with cheese mixture. Secure openings with wooden toothpicks. Season chicken with pepper and kosher salt. In a large nonstick skillet heat oil over medium-high heat. Add chicken; cook for 12 to 15 minutes or until tender and no longer pink (170° F), turning occasionally to brown evenly (reduce heat to medium if chicken browns to quickly). Remove chicken from skillet. Cover and keep warm. Remove skillet from heat for 1 minute. Carefully add chicken broth to skillet. Return to heat; bring to boiling. Gradually add spinach to skillet, cooking and tossing with tongs just until spinach is wilted (should take 2 to 3 minutes total). Stir in the nuts and lemon juice. To serve, divide spinach mixture among four dinner plates. Top with chicken breasts. If desired garnish with lemon slices. Nutrition Facts per serving: 266 cal., 11 g total fat (3 g sat. fat), 92 mg chol., 345 mg sodium, 4 g carbo., 2 g fiber, 37 g pro. For Wave 1, serve with cooked quinoa and cooked zucchini. 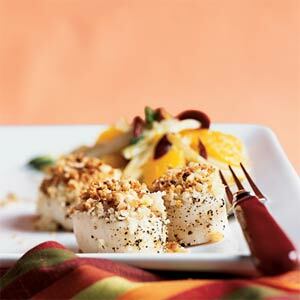 For waves 2 and 3, serve with cooked quinoa and fresh berries. Preheat oven to 375°F. Coat six 6- to 7-inch individual round baking dishes or pans* with nonstick cooking spray. Carefully press tortillas into dishes or pans. Sprinkle with cheese. In a small covered saucepan cook the broccoli and bell pepper strips in a small amount of boiling water about 3 minutes or until crisp-tender. Drain well. Sprinkle cooked vegetables over cheese in baking dishes. In a medium bowl whisk together eggs, evaporated fat-free milk, thyme, kosher salt, and black pepper until well mixed. Pour egg mixture over vegetables in baking dishes. Place on baking sheet. Bake for 25 to 30 minutes or until puffed and a knife inserted near the center of each comes out clean. Let stand for 5 minutes before serving. If desired, garnish with additional strips of bell pepper. Nutrition facts per serving: 185 cal., 8 g total fat (3 g sat. fat), 151 mg chol., 314 mg sodium, 13 g carbo., 6 g fiber, 15 g pro. This entry was posted in Recipes and tagged Breakfast, Sonoma Diet, Wave 1, Wave 2, Wave 3 on February 7, 2011 by Mike. Preheat oven to 350°F. Lightly coat a 9-inch pie plate with cooking spray. In a medium bowl combine eggs, pastry flour, garlic, dillweed, pepper and kosher salt. Stir in cottage cheese, broccoli, feta, and cheddar. Spoon into the prepared pie plate. Bake for 40 to 45 minutes or until a knife inserted near the center comes out clean. Cool on a wire rack for 5 to 10 minutes before serving. Nutrition facts per serving: 188 cal., 10 g total fat (6 g sat. fat), 134 mg chol., 575 mg sodium, 9 g carbo., 2 g fiber, 16 g pro. Exchanges: 1/2 Vegetable, 1/2 Starch, 2 Lean Meat, 1/2 Fat. Really just testing but this is Michelle and Mike’s D&D group. This entry was posted in Calendar on July 28, 2007 by Mike.